Our selection of temperature control thermocouples, sensors, and probes includes products of various sizes and configurations to fit on your countertop or floor equipment. Plus, many of these items come with the hardware needed to properly install them, so you can get your appliances up and operating more quickly. Best of all, since these components are made from durable materials, they’ll last a long time in your high-volume establishment before having to be replaced. For other great supplies to have in your commercial kitchen, check out our thermometers, turners, and oven mitts. 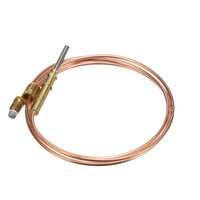 If you're wondering where to buy bakers pride temperature control thermocouples, sensors, and probes shown as grid listing, sorted by price low to high, we have a large selection of bakers pride temperature control thermocouples, sensors, and probes shown as grid listing, sorted by price low to high for sale at the lowest prices.